Dr. Jean P. Black in 1953. 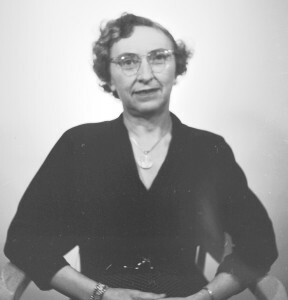 Dr. Jean P. Black (1903-1992), Portland State University’s first librarian, had already led a national and international academic career before she arrived in Portland in 1946. Born in Duluth, Minnesota, she spent most of her childhood in Europe until she was compelled to return to the United States during World War I. By 1932, she had earned four degrees from three colleges, including a Ph.D. in History from the University of Michigan and a B.S. in Library Science from the University of Washington. She studied in Rome, Italy, for her doctorate and worked as a research librarian for numerous American institutions on her return to the U.S., including Stanford’s Hoover Library and the Iowa Historical Society. Her desire to return to the West inspired her to contact William Carlson, the director of libraries for the Oregon State System of Higher Education, requesting consideration for placement in any library in the system that might have an appropriate vacancy. Carlson correctly perceived that Black was capable of being an “independent operator” and recommended her to Vanport Extension Center director Stephen Epler, who hired her to establish and direct the library for the brand-new college, which opened in September 1946. 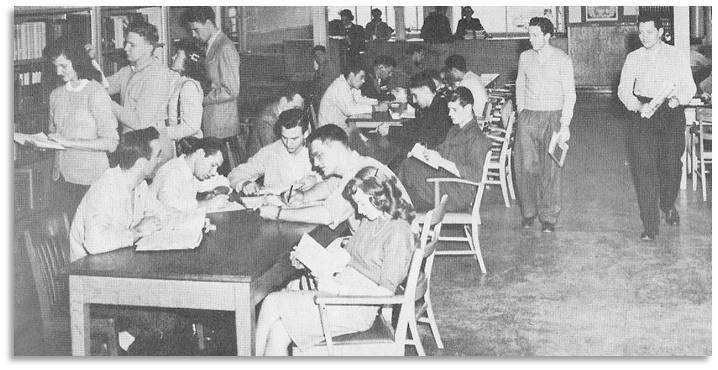 Students in the Vanport Extension Center Library in 1947. Aware that the incoming student body was made up almost entirely of young men returning from military service who had little experience with scholarly reading and research, Dr. Black made it a priority to teach students how to use library collections while responding to their needs to develop Vanport’s library holdings. All this she accomplished virtually single-handedly and as one of the few women on the faculty. She anticipated that Vanport College and its library would have a brief existence, ending in a few years after its first students took their credits to four-year colleges or graduated into their postwar careers. The city of Vanport itself was planned to be temporary, although it continued to provide much-needed housing. But the Columbia River flood of May 1948 brought the “U on the Slough” and the the rest of Vanport to an early end. All that was left of the library Dr. Black had started from scratch were the books that were checked out. 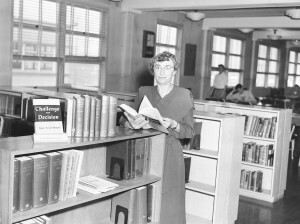 Dr. Black in the library in “Old Main” (Lincoln Hall), 1951. Undaunted, she began again in two more temporary locations before the college, now called Portland State, settled permanently in downtown Portland in 1952. Dr. Black was one of only four professional librarians on staff when the college achieved degree-granting status in 1955. Professor Dodds summed up some of the challenges she faced throughout her career at Portland State: “On the eve of four-year status, librarian Jean Black pointed out three great problems that harassed library patrons: there were too few trained librarians; there was inadequate storage for periodicals and inadequate funds to bind them; and there was crowding in the reading room, where students maneuvered for passage between shelves and tables (‘a heterogeneous lot, battle-scarred and ugly’). Black obtained no secretarial help until fall 1954, but received support in the form of the first library faculty committee, which relieved her of the burden of selecting all the books herself.” Dr. Black also oversaw the collection’s reclassification from the Dewey system to the Library of Congress in 1958. 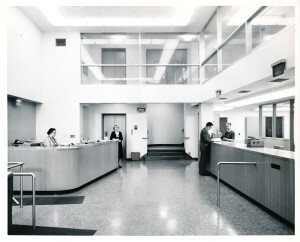 The new lobby of the Portland State College Library in 1960. By 1960, Portland State College opened its first “modern” library building specifically designed for the purpose. Rising enrollment and expanding academic programs set a fast pace for librarians and library staff, as Dr. Black observed in the early 1960s: “You have to catch on quickly and be ready to take on something new at a moment’s notice to keep pace here.” The busy Library quickly outgrew its container, which also shared walls with the noisy and bustling College Center. 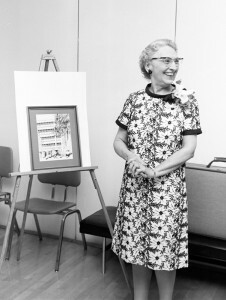 Dr. Black celebrating her retirement in 1969. March is Women’s History Month! Women of Library History 2016 is a project of the American Library Association Feminist Task Force honoring women in librarianship. Portland State University Archives is proud to take part! Follow Women of Library History throughout March for more stories of women’s contributions to their communities through libraries. Black, Jean Phyllis. Memorandum to Library Faculty, November 2, 1961. Library History Collection, Portland State University Library Special Collections and University Archives, Portland, Oregon. Black, Jean Phyllis. Interview with Karen Wingo, May 7, 1980, transcript. Library History Collection, Portland State University Library Special Collections and University Archives, Portland, Oregon. Black, Jean Phyllis. “Vanport Starts Them to College.” Library Journal, December 1, 1947. Dodds, Gordon B. The College that Would Not Die: The First Fifty Years of Portland State University, 1946-1996. Portland: Oregon Historical Society Press, 2000. Rodgers, Frank. Interview with Sharon Elteto and Kristen Kern, [2006? ], transcript. Library History Collection, Portland State University Library Special Collections and University Archives, Portland, Oregon. University of Michigan. “News from the Classes.” The Michigan Alumnus 45 (1939). https://books.google.com/books?id=ACNYAAAAMAAJ Accessed February 2016.